At the entrance of Nea Vrasna, the Zanet Palace, in harmony with the environment of the area, is waiting for you to relax and rest during your summer vacation. Stone and Water dominates the exterior of Zanet Palace, while in our rooms dominates wood element. Our pool, with umbrellas, deck chairs and tables around the pool, is an everyday oasis without having to leave from Zanet Palace. 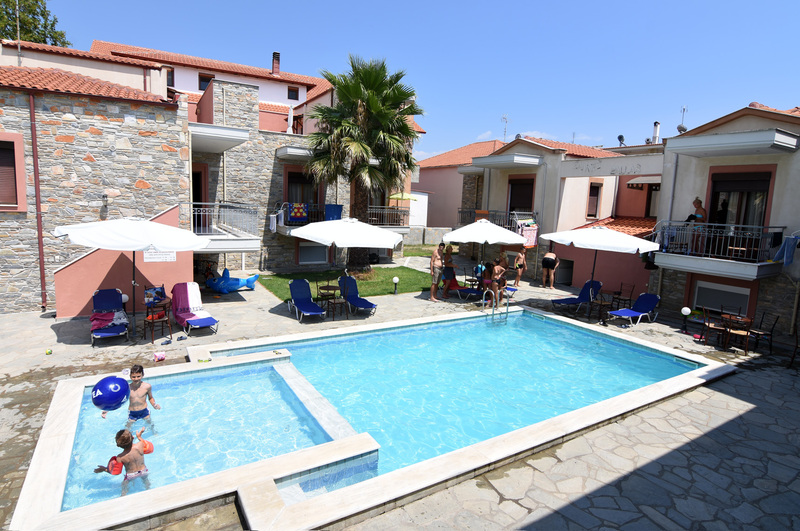 Our pool, also has space for small children where, with the help of their parents, they can swim safely. Our twelve rooms, divided into triple and quadruple rooms are spacious and comfortable and provide all modern amenities for a cool summer experience in Nea Vrasna. In the garden of Zanet Palace you will find a space dedicated to young children, a playground where your children can play safely. In front of and next to Zanet Palace, you will find a comfortable space to park your car, and right across the street there are 2 large super markets to buy everything you need. Zanet Palace is an ideal destination for family vacations.